An ecological undertaking in Serengeti National Park has removed 17,536 snares from the 14,750 square kilometre park. AN ecological undertaking in Serengeti National Park (SENAPA) has removed 17,536 snares from the 14,750 square kilometre park. The Frankfurt Zoological Society (FZS), Tanzania National Parks (TANAPA) and Tanzania Association of Tour Operators (TATO) jointly executed Serengeti De-Snaring Programme, which has as well rescued 157 wild animals from the traps laid by poachers within the ecosystem. The snares have since been set ablaze, according to FZS Programme Leader in Serengeti Erik Winberg. Mr Winberg, updating tour operators and key stakeholders in the industry on Monday, said poachers in the Serengeti had killed hundreds of animals, adding that the joint programme seeks to support particularly tour operators who rely on wildlife and intact ecosystem as the basis of tourism in the area. "At least 530 animals were killed by poachers in the past 16 months while we also established 125 camps that were put up by poachers," explained the FZS official. According to Mr Winberg, the project also helped in the arrest of 32 poachers who were found in the area. Describing the joint operation, Winberg said the 16-man anti-snaring team is led by retired TANAPA rangers and other community members from villages surrounding the Serengeti, making use of ex-poachers and exploiting their experience to fight snaring. "The teams cooperate closely with SENAPA authority and go out to the field to collect snares before destroying them," he said, adding: "When the de-snaring teams find a poacher's den, they destroy the bush meat and other snaring materials to deter poaching activities." He added that the snares laid by the poachers target species like wildebeests for bush meat which is later sold. The wildebeest is the most snared animal due to their large number and predictability of annual migration, he said. Winberg said 5,000 US dollars (about 12m/-) cover the cost of running one team for a month, with an average of 35 snares collected daily. The programme's funding comes from voluntary donations based on a bed night fee for hoteliers and camp operators operating in the Serengeti. Winberg called for public-private partnership to keep project up and running. SENAPA Chief Park Warden William Mwakilema commended FZS for its efforts in protecting and conserving the park, saying poaching and other related activities could soon become a thing of the past if the efforts are sustained. 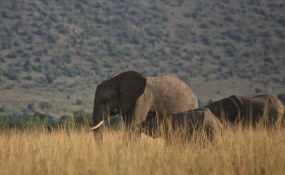 Poaching remains a major challenge to conservation in Tanzania, with between 20,000 and 30,000 African elephants slayed annually for their tusks, primarily to satisfy the demand for ivory products in Asia.